The most consistent action for catching spring coho from the Lake Michigan shoreline is in March. This is right after the ice goes out until the near-shore water temps reach 48–50 degrees – at which point the coho move offshore. However, cohos can be caught from shore from January to mid-April if conditions are right. A few places you can fish: East Chicago Marina break wall; BP Whiting Discharge; Hammond Marina break wall; Portage Lakefront Park; Port of Indiana Shore Fishing Site; and Michigan City (pier at Washington Park, or DNR/Coast Guard Access in the inner harbor). Fishing access can be found using the Where to Fish Finder. 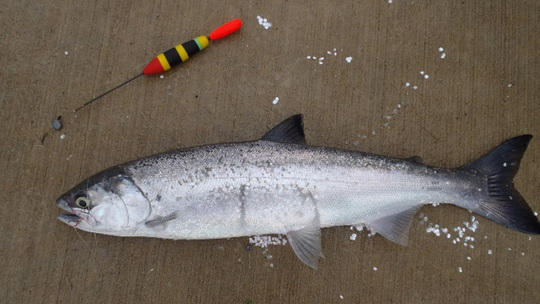 Most coho taken by shore anglers are caught on live bait. Up to three rods are permitted, which can increase the odds of catching a fish. Practically any spinning rod spooled with 6-10 pound test monofilament line will work for fishing for live bait. Usually, the best tactic is a simple bobber rig. Suspend a size-2 to size-6 hook about 4-6 feet under a bobber. Bait with small spawn sacs, salmon skein, tube jigs tipped with waxworms, small pieces of shrimp, nightcrawlers or minnows. Helpful tip: Experiment with a mix of bobbers and bottom rigs and switch to the presentation that works best. Fishing on bottom is more likely to result in other fish such as brown trout or whitefish. Anglers will need both a fishing license and a trout stamp. You can find the DNR fishing reports online.